Cosby Art Glass Co. was started by Chris Cosby in 1978 and is run by Chris and his brother, Tim. Both brothers were born in St. Louis and were raised in Webster Groves and Kirkwood, Missouri. Many relations on both sides of the family have been professionals in art, architecture or fine crafts for generations. Their father, Ed, was an Art Director for Gardner Advertising in St. Louis and worked on many large accounts, including Purina and Anheuser-Busch. As much as was possible, both Chris and Tim pursued art in Elementary and High School. 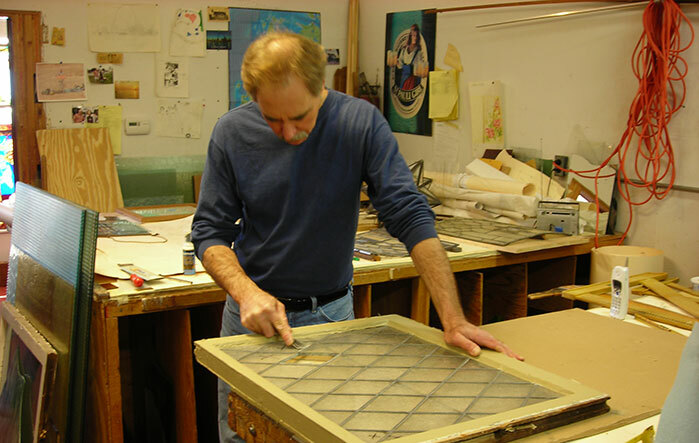 After graduating from High School in 1973, Chris started studying Art at Meramec Community College, but soon left to start working at one of the largest stained and art glass studios in St. Louis in 1974. This year, 2014, marks his fortieth year in the trade. Tim, after graduating from High School in 1977, went on to study printmaking and sculpture at Meramec and then at Washington University in St. Louis, graduating from there in 1982. After studying Celtic Art in Britain and Ireland in 1983, he joined Chris at Cosby Art Glass in 1984. This marks his thirtieth year in the trade. Together, Chris and Tim bring a combination of varied approaches and viewpoints to the business which is greater than the sum of its parts. St. Louis is an exceptional city for the practice of stained and art glass production because of its German heritage. Not only the churches of the city feature art glass, but many, if not most, of the homes do as well. And the homes need not be large or extravagant, either - although the city has its share of Victorian and early to mid-twentieth century mansions. Many of the homes we work in are small bungalows with art glass fireplace windows and/or entryways. The fact that so many old homes feature stained and/or art glass windows tells people building new homes or renovating older homes that they can have their own art glass - and that they can order whatever they want to as far as subject, style, color, etc. The history and variety of art glass in St. Louis makes it a fertile environment for a business such as ours. If you would like to sign-up to the receive news updates, please enter your email address below. Copyright © 2019 Cosby Art Glass. All Rights Reserved. SEO and Site Development By Elite Web STL.